Lucia’s friend and fellow badass Liz Winters is on the show today! 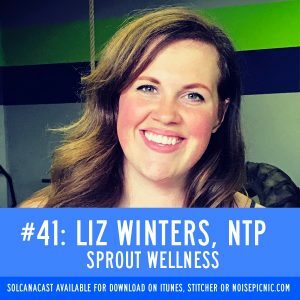 Liz is the owner of Sprout Wellness, a nutritional therapy practice specializing in supporting the health and wellness of anyone navigating the prenatal or postpartum world. Listen in as Liz talks baby food, total body empowerment, and her thoughts on drinking coffee while you’re pregnant. Like what you’re hearing? Great! Leave us a review iTunes and we’ll send a personal shout out to you! Alyssa H: do i really need to eat 100 grams of protein a day? cant i just eat like a normal healthy diet? also what’s up with coffee? what’s up with alcohol? Alana H: I’m so freaked out by stats that claim childbirth causes huge pelvic floor damage. How do you know if your pelvic floor is in good enough shape to withstand birth without significant physical trauma? Pelvic floor exercises: banded squats, clamshell raises, glute bridges.